The Indigo Spell, the third book in Richelle Mead's Bloodlines series, just came out this month and I had a lot of fun counting down to the release with the Marcus Finch clues. If you've read the book, then you know that the ending was another cliffhanger (Mead has us wrapped around her little finger). But for a little relief...today the cover for the fourth book, The Fiery Heart, was revealed on Bookish! Check it out! I'm not always crazy about the design scheme of the covers in this series, but I like this cover. It's warm without being in-your-face orange, and the faces on the cover don't look as awkward as they did on The Golden Lily. What do you think? 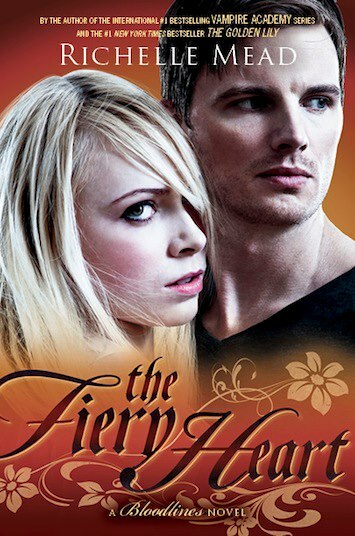 The Fiery Heart will be out on November 19th, 2013. Click here to read more at Bookish! Click here to read my review of The Indigo Spell. Love the colors and the font. I need to start this series.